Lamenation is Ken Scholes debut novel, and the first in his planned five-book series titled The Psalms of Isaak. Over the first pages of the novel, the center of the known world, the city of Windiwir, is burned from existence by a powerful and mysterious attack. The narrative then unfolds through several points-of-view from the moment of that cataclysm to the political, psychological, and relational fallout that it ignites. Lamentation is a story about war, intrigue, betrayals, mysteries, hope, but mostly loss. The main plot lines of the story revolve around the slowly unveiling lines of plots on top of plots… secrets, secrets all around. Oddly, Scholes makes all of this uncertainty work to his advantage as he quickly and methodically builds his world, his characters, and the main story lines. Scholes’ story is quick paced, moving from important scene to important scene with very little excess. The novel is relatively thin for the opening book of an epic fantasy series. This is rather refreshing and surprisingly doesn’t come at the expense of the characters or the world, which both are interesting and developed. There are a lot of interesting things going on during the course of Lamentation. 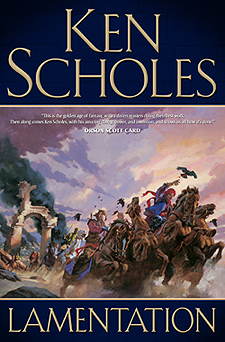 As Scholes reveals his world, the more he draws his readers into what is a complex and interesting concept… that of an old world, having had multiple periods of great technology and vast civilization, followed by periods of near total self-destruction and de-population. The legacy of the world, the record of technology and of magic, the source of rediscovery and redevelopment of lost knowledge, has been burned away in the destruction of the city of Windiwir. What is left? What should be done? Why did it happen? How? Who? Those are the central questions for the characters in Lamentation. Scholes uses that pursuit of answers to shape his characters in interesting ways. How is a person the result of the sum of the events of their lives? How does loss define a person? What is hope? While Ken Scholes has previously published various short stories, Lamentation is his first novel length story. The book is a strong debut in that is holds together well, is well written, and features good development of the characters and the world without getting too caught up in either. There are a few moments that break the pacing or the feel of the story that a reader can expect in most stories. Scholes sometimes spends a little too much time in action scenes giving move-by-move storytelling, and occasionally details seemed to be expanded on simply because they are ‘cool’. These moments are few and far between in what is otherwise a very controlled and well-crafted novel. What else is there to say about Lamentation? The best thing about the book is that it is an entertaining page turner that features a good story, a detailed plot, and compelling characters. There are kings, scholars, Popes, spies, warriors, and even a ‘living’ robot. Yes, I said robot… and it even works in the context of the story! A reader can’t ask for too much more than that. Ken Scholes is a new author to keep an eye on. Based on his work in Lamentation, and in his short story collection, we can expect to hear a lot more about Scholes in the future. In the meantime, I certainly have no problems recommending that you go out and find a copy of Lamentation by Ken Scholes especially if you enjoy epic fantasy, or are looking for a little different take on the genre. Reminder: I have 3 copies of Lamentation to give away to people that have US mailing addresses. If you're interested in entering the drawing for one of those copies, you need to Noteboard me before Friday, October 16th. Remember to have "Lamentation" as your subject. I will do the drawing during the day on Friday. Oh, if you're not from the US and still hope to get a free copy, NB me, tell me where you're at, and I might be convinced to personally send my own copy.